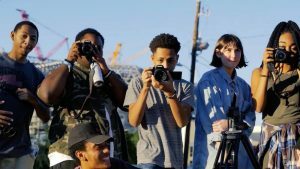 How can Atlanta teens get involved in Georgia’s growing entertainment industry? Are you looking for information about opportunities for teens in the film industry? Georgia Film Site reached out to re:imagine/ATL who shared some insights about how teens get involved in Georgia’s growing entertainment industry. Our Founder, Susanna Spiccia created our name, re:imagine/ATL, as a way to encourage young global changemakers. We wanted our youth to know that if they choose, they have the power to be the change they want to see in the world. We want them to know that through the power of storytelling, students can literally reimagine, and recreate their own communities. What programs are available to teens? We offer re:imagine Workshops throughout the year in partnership with Atlanta’s local film and media industry so students get hands-on experience with professionals. The workshops provide brief points of insight and exposure for students and parents. re:imagine/COMMUNITY is our in-school program that allows us to partner with schools and explore the power of storytelling. Over the course of 10 weeks students learn how their personal stories can help impact their greater community through film and media production. It serves as an in-depth introduction to the filmmaking process. The No Comment Fellowship is a one year program that equips students with the training, connections, and equipment needed to take their storytelling to the next level in preparation for college and career placement. Fellows produce film festival-worthy content and have access to travel and studio tour opportunities. The Green Room Music Video Summer Camp is a 5-day experience that allows students to explore writing, producing and editing an original music video. During this time students work closely with local filmmakers, visual artists, and musicians. The final videos premiere at the Purple Sparkle Carpet event each year. Why do teen stories matter? Teen stories are so critical because young people are living in a world where adults are making decisions for them every day without including them. These are decisions that will impact them for the rest of their lives. At re:imagine/ATL we practice listening first and then teaching. We want to know what motivates them; what brings them joy; what keeps them up at night; what they’re most afraid of, and then equip them with the skills and tools to tell their side of the story. That’s where the real work begins. The re:imagine/Alliance is a network of organizations in the creative media industry who support our mission and vision by providing capital, career exposure, and training to aspiring high school leaders. This year’s Alliance, was launched with sixteen partners in the industry. The financial investment from Alliance partners goes directly to support the operating expenses of our organization, so we can provide programming kids can always count on. What resources, mentoring and job shadowing opportunities are available through the partner companies? Partners in the re:imagine/Alliance commit to any one of the following career exposure opportunities: hosting a workshop; video conference with high school A/V classroom; job shadowing days; Lunch & Learn with an Executive, offering company space; or internships for our current students or alumni. Representative storytelling happens when people who have been consistently overlooked and unheard, are finally offered a seat at the table. It’s about giving people the opportunity to be seen and heard across media in the most authentic way. Representative storytelling is inclusive and reflective of cultural background, gender identities, ethnicities, socio-economic status, sexual identities, intersectionality, or level of ability. Representation in this industry is so important because it sends a powerful message that as you are, you are worthy of being seen and heard.